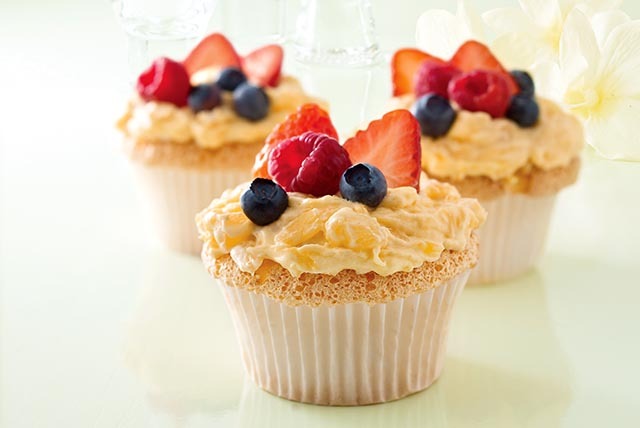 Frost angel food cupcakes with this creamy pineapple topping and fresh berries for a simply stunning dessert. Prepare cake batter as directed on package. Pour into 24 paper-lined muffin cups. (Batter will nearly fill cups.) Bake 26 min. or until tops are light golden brown. Cool in pans 10 min. ; remove to wire racks. Cool completely. It's important to bake cupcakes immediately after filling muffin cups to prevent cupcakes from sticking to paper liners. Use small knife to cut "x" in top of each cooled cupcake. Spoon 1 Tbsp. Cool Whip mixture into centre of each cupcake. Frost top with remaining Cool Whip mixture. These easy-to-make cupcakes are sure to please family and friends and can be part of a healthful eating plan.